Beauteque is one of my favorite websites to shop at when I’m looking for beauty and skincare products from the Eastern side of the world! 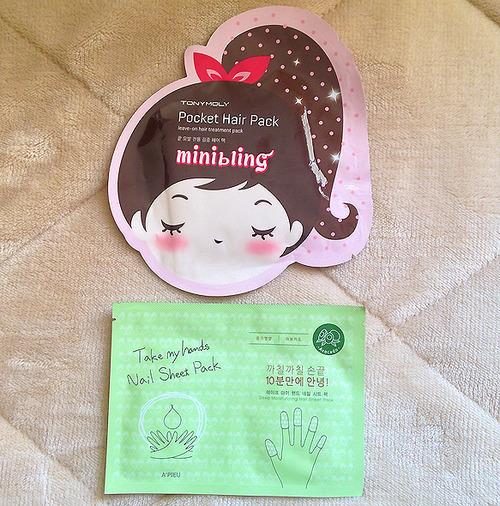 They have an AMAZING variety of products – I’m particularly addicted to their sheet masks! The BB Bag is their monthly subscription beauty bag. 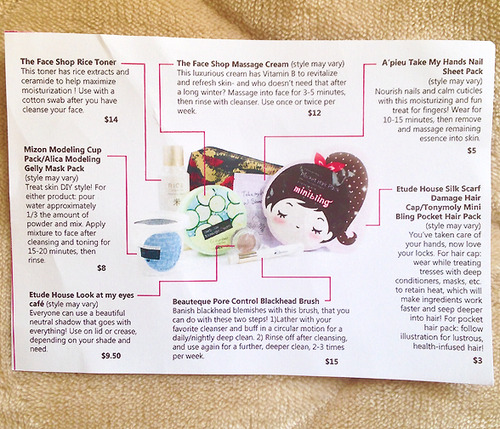 Each month Beauteque will send you a bag full of 7-8 full sized beauty, skincare, fashion, and lifestyle products but I’ve noticed they have a larger focus on skincare. Each bag also has a few products where subscribers can choose a specific scent, shade, etc. Options will be emailed in a survey format on the 15th of each month and if you don’t choose by the 20th, the Beauteque team will choose for you. $24 + shipping for 1 month. Shipping fees are 3.95 for the US, $5.95 for Canada, and $8.95 for Europe. If you subscribe by the 5th of the month, you will receive the BB Bag of that month, if you subscribe after the 5th, you will receive the BB Bag for the next month. 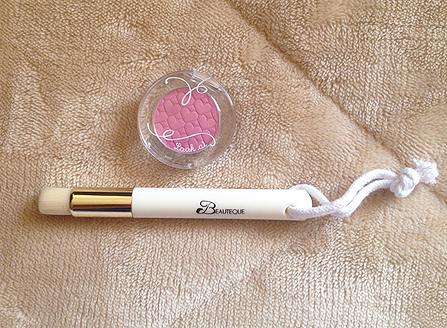 Before I get to the products I have to mention how great Beauteque’s bags are! I love the diverse styles, patterns, and material they use and I think they’re the perfect size for me! This month’s bag has a really pretty lip pattern on it and it’s definitely going into my school bag for sure! This month’s theme is “Our Lips are Sealed” and the bag was curated to give the best of the best. I never used a hair pack like this before so I’m really excited to try it out! It’s a leave in hair treatment for the ends of damaged hair. You’re supposed to leave it on for 15-30 minutes and remove it. It looks pretty simple to put on, you basically put the pack on your hand like a glove and wrap it on your hair like a pony tail – that probably sounds confusing but the picture instructions look simple! The Nail Sheet Mask was customizable, I chose the Avocado while the other option was Berry. This nail pack nourishes nails and cuticles, you wear it for 15 minutes and massage the remaining essence into your skin! I’m still using the toner I got from the Head to Toe Milk Bag but I opened this one anyways because it’s supposed to be super moisturizing. I’ve only been using this for 2 days but I love the way it feels and it does help moisturize my skin more than other toners have! I’m glad Beauteque put the Mizon Pack in a ziploc bag because some of it did spill but I’m glad the cup itself didn’t break! For this product, you use a 1:3 proportion with water and powder and then mix it together. Leave it on your face for 15-20 minutes and then rinse! Subscribers were able to choose between Cucumber and Mugwort massage creams. The cream has Vitamin B to refresh and revitalize skin, you massage it on your face for 3-5 minutes and then rinse it off with a cleanser – use 1-2 times a week. I used this about an hour ago and have to say I’m impressed! 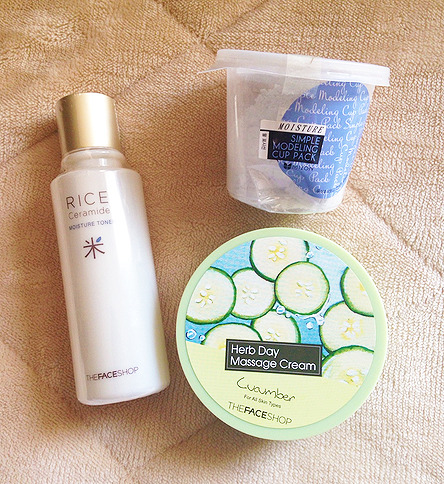 The cucumber scent was pretty strong when I opened it – I don’t like the smell of cucumber at all – but I’m happy to say the scent was minimal when I applied it to my face and massaged it in, it felt so creamy and moisturizing! My skin was left super refreshed and soft after washing it off! I was really happy seeing an eyeshadow in this bag! I’ve never used one from Etude House is one of my favorite brands so fingers crossed I love this shadow as much as their other products! I honestly had no idea brushes like this existed, I’m intrigued and I’ll be testing it soon! I loved Beauteque’s foundation brush from one of their BB Bags last year so I do have high hopes for this one. I’m glad they have a string at the end so I can hang it off the rack in the shower! 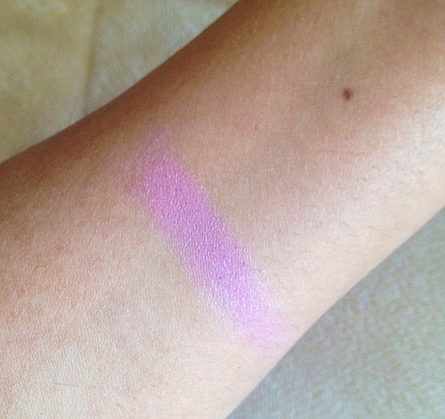 I like the pigmentation and it’s not chalky at all, I know I’ll get tons of use out of this! This month’s bag retailed for $69.50 according to the prices listed on the card but I noticed some prices are inflated, I found cheaper prices of some of the products on other websites. That being said, from the calculations I did, the value of this bag is still higher than the price! My favorite products from this bag are the toner, massage cream, eyeshadow, brush, and the bag itself! This actually might be my favorite BB Bag yet! If you want March’s BB Bag, be sure to subscribe by the 5th! You can subscribe here! If you subscribe after the 5th, you will get April’s BB Bag. This post may contain affiliate links. I received this item in exchange for my honest, unbiased opinion. All opinions expressed are my own and I would not promote an item if I did not think it would spark interest to my readers. Same here, I've used this a few times and noticed they do remove some blackheads but it also irritates my skin, I'll have to try softer techniques!